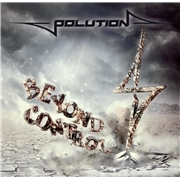 POLUTION was formed back in 1997, and have achieved two full-length albums, one in 2007, and this one now in 2012. The band originally performed covers, and have supported the likes of AC/DC, KROKUS and JOHN COGHLAN (ex. STATUS QUO). Their debut “Overheated” is described as somewhat quirky, this time they opt for a more polished sound, somewhere in the region of GOTTHARD and KROKUS, or even NICKELBACK, argh. But what about the voice!? After a short intro they go for the ok “Fire”, with a nice refrain and some force behind it…but the voice seems uncomfortable with the style? The pace is not always amusing, the songs are even vague at times, like “Forever and a Day”, and I don´t remember the lyrics. Apart from the tedious but hilarious “The Band”, which has pubertal lyrics. They even go for “Jeremy-territory” towards the end, but the nineties were the wrong way out for this lot. I can´t imagine AC/DC-fans falling over this one, and where is the pure entertainment the info promised? This album is strangely meek for Escape Music.